The Milan’s new skyline has become an part of the Milano Expo 2015 experience. An attractive skyline tour to discover the Europe’s largest building project, the new area around Garibaldi station and Porta Nuova area. Word famous architects build a futuristic eco-sustainability district in one of the largest buildings sites: the Porta Nuova and Corso Como district, creating a new hub of design, culture and fashion. During the tour you visit the new skyline with an expertice guide the new skyscrapers of the Uni credit bank in Piazza Gae Aulenti with water features and plays of light and the skyscrapers "bosco verticale" (vertical forest) – two new residential buildings covered vertically by trees on the balconies. The Milan Skyline tour starts with minimum 2 participants and not more then 15 people, the price depents of the number of participants. 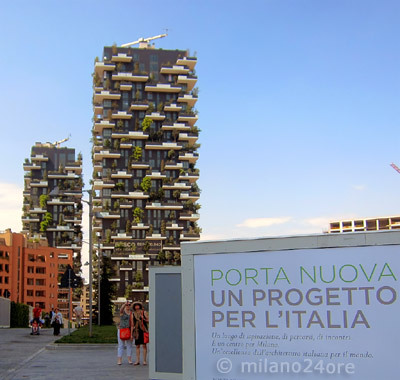 Welcome to the new Milanese skyline. Thanks to the Porta Nuova project, Milan is now an urban metropolis with a decidedly international allure. This is about the ultra modern commercial and residential skyscrapers and complexes in Porta Nuova, the new city center, where architects like Cesar Pelli, Cino Zucchi, Antonio Citterio, Stefano Boeri, Michele de Lucchi have left their mark. With your guide who is an architect, you will learn about the Bosco Verticale (Vertical Forest) and two of the most eye-catching skyscrapers. This small-group tour is limited to 15 people for a more personalized experience. DISCOUNTS or FREE for the Top Attractions, Tours, Museums, Restaurants, Airport bus and much more.